Who makes the best cashmere sweaters? How do we properly care for cashmere? Let me address the care of cashmere first, then I’ll put our favorite brands at the end of this post. I know most cashmere sweater labels state, “Dry Clean Only” but they’re wrong. 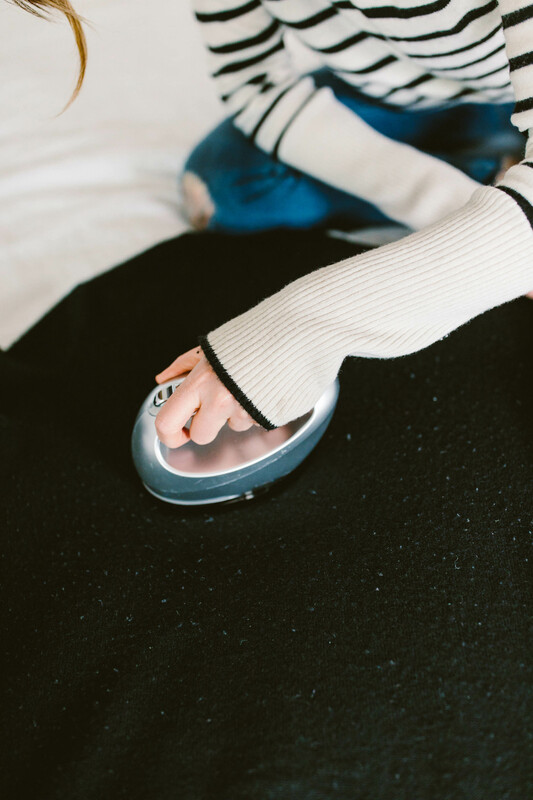 Dry-cleaning uses harsh chemicals that can actually break down the cashmere fibers over time, and ultimately results in a less soft, thinner sweater. Nothing can make soft cashmere turn scratchy like a dry cleaner. 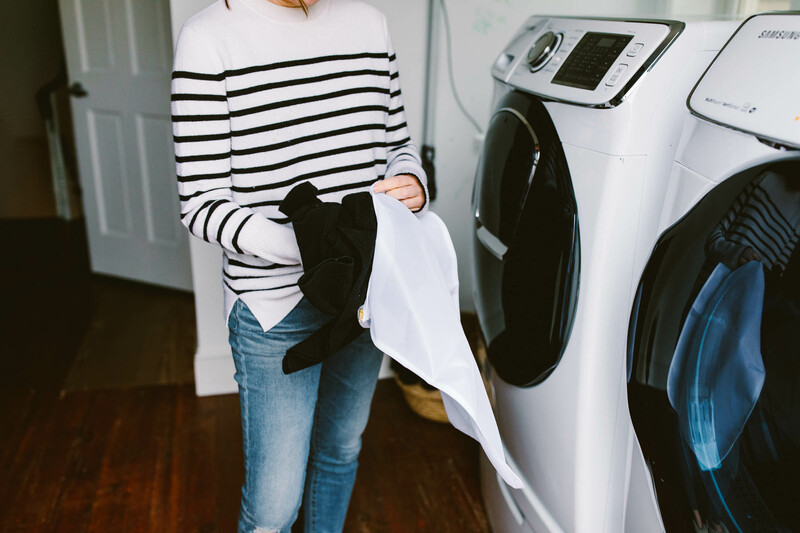 You can hand-wash your cashmere sweater (fill up sink, add gentle detergent, let cashmere soak for 30 min)….but I find it annoying, and machine washing works just as well. So…. 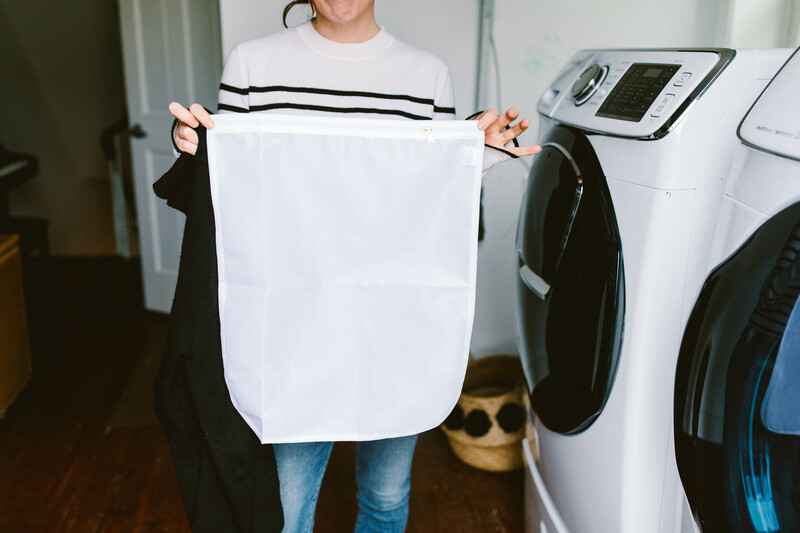 These fine mesh laundry bags can be picked up on Amazon, but get one big enough to fit your cashmere sweater (or sweaters). 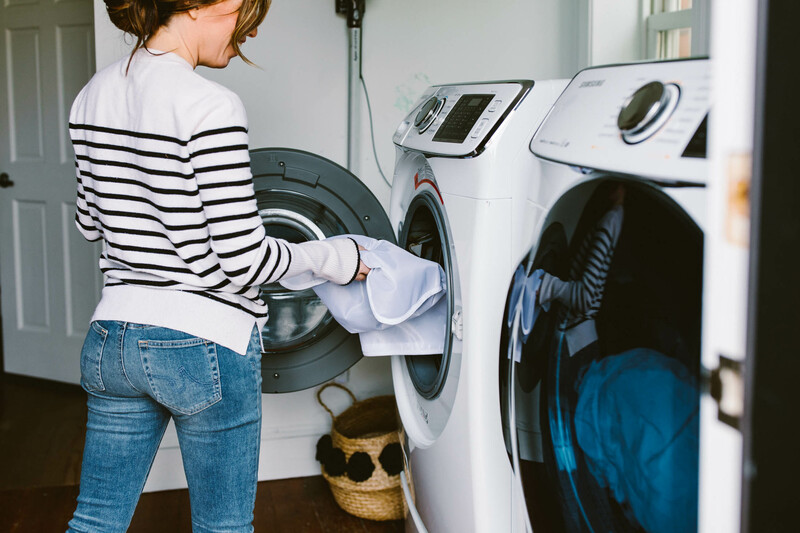 They’ll prevent your cashmere from snagging or pulling while in the washing machine (this is especially important for top-loading machines). If you are *really* concerned about pilling, use one bag per sweater. The most important part of machine washing cashmere is the temperature of the water: cold. And if you have a top-loading machine, I’d also choose the delicate cycle. Front loading machines? Well…the delicate cycle *might* still be the best choice, but I’ve been washing my cashmere for years on the regular cycle. And as long as it’s being washed in cold water — for both wash and rinse — it comes out beautifully. The biggest perk to machine washing cashmere (rather than dry-cleaning)?? The cashmere comes out baby soft. Like clouds, cotton candy, and happiness soft. Once again, there’s probably a difference between The Best Option…and the one I end up using. The best option? The Laundress’ Wool and Cashmere Shampoo. The scent helps repel moths, too. However….I personally found the scent too strong. The Laundress’ Delicate Wash is the one I sometimes use. 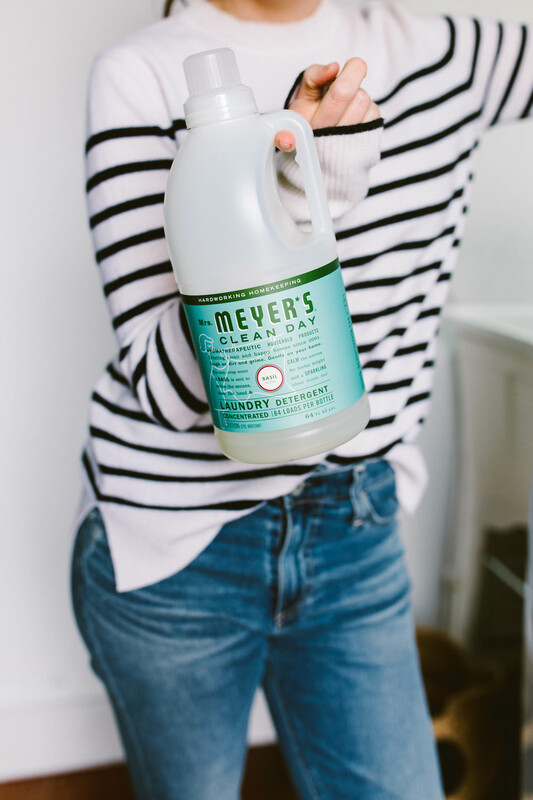 However, in recent years…I’ve found that as long as I’m using a natural-ish laundry detergent that isn’t filled with harsh chemicals (say no to Tide)….my cashmere sweaters come out just fine. This is a big one. Never hang wet cashmere (unless you are trying to repair a sweater that shrunk previously). Hanging will elongate the sweater, and you’ll have hanger marks from where it was hung. 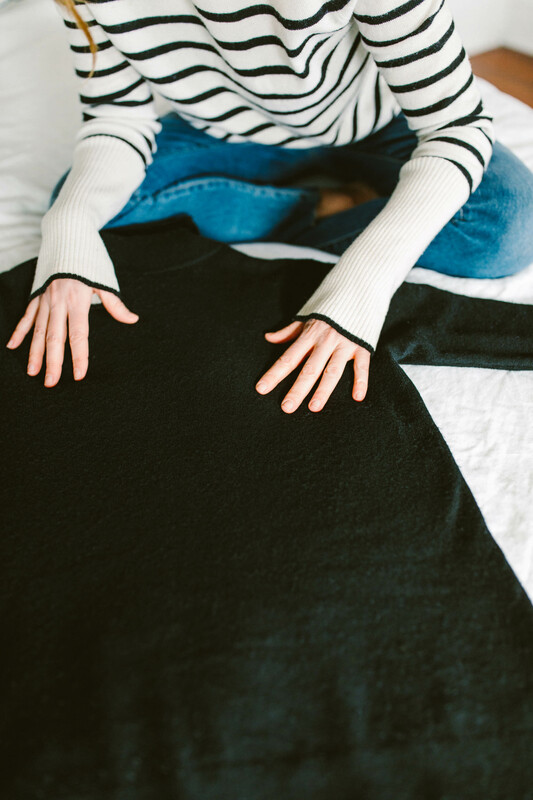 Instead, lay it flat to dry, and, if necessary, reshape the sweater a few times as it dries. If you washed on cold, the sweater really shouldn’t shrink, but a few times I’ve noticed that my cheaper cashmere sweaters do shrink up in the arms sometimes. Gently pulling them back into shape as they dry totally works. You can always roll them up in a towel to squeeze the excess water out, but I’ve found that cashmere tends to come out of the spin cycle damp, rather than sopping wet. 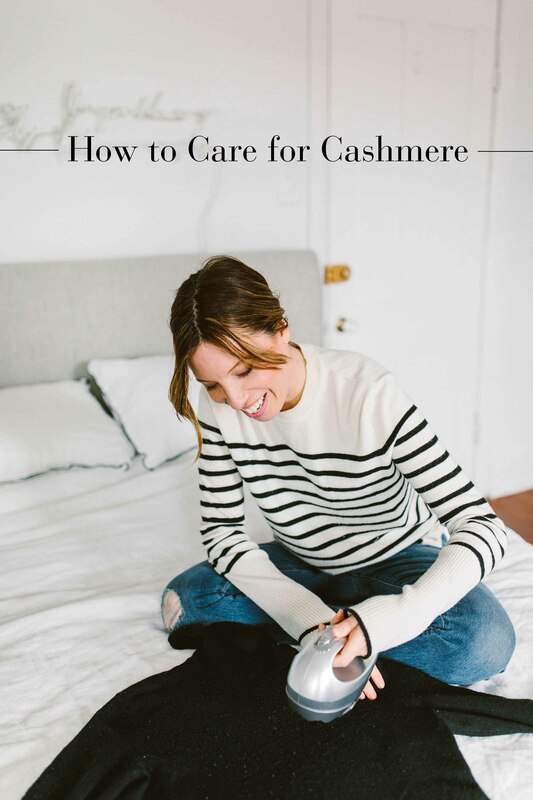 Each year I get a ton of questions from readers about Which Cashmere Doesn’t Pill?? It’s an easy answer: none of them. There is not a cashmere sweater alive that doesn’t pill eventually. Pilling isn’t necessarily a sign of cheap cashmere, it’s a sign of use. That said, thicker cashmere — the really good kind with a tighter weave — takes longer to pill. But it’s also around $400-$500 per sweater. 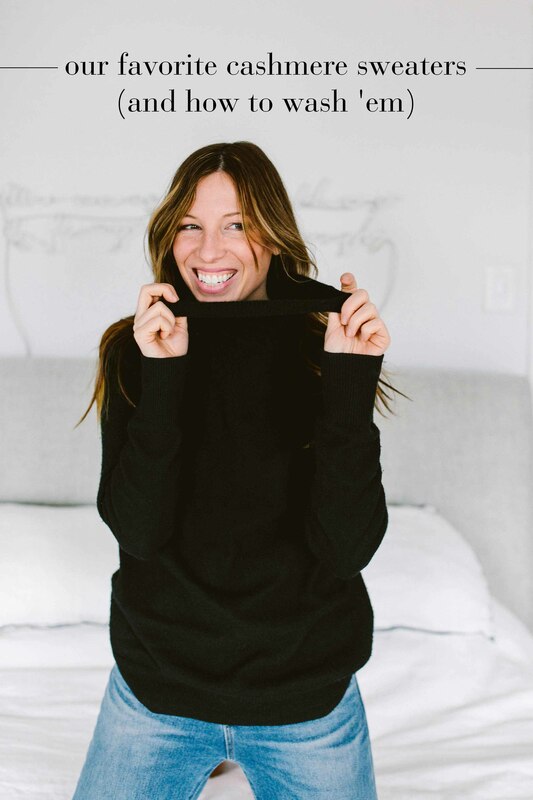 And if you wear your cashmere (either the $100 everyday cashmere or the super-fancy $500 cashmere) like I do — and you SHOULD, durability is a major selling point of the stuff — both will eventually pill. 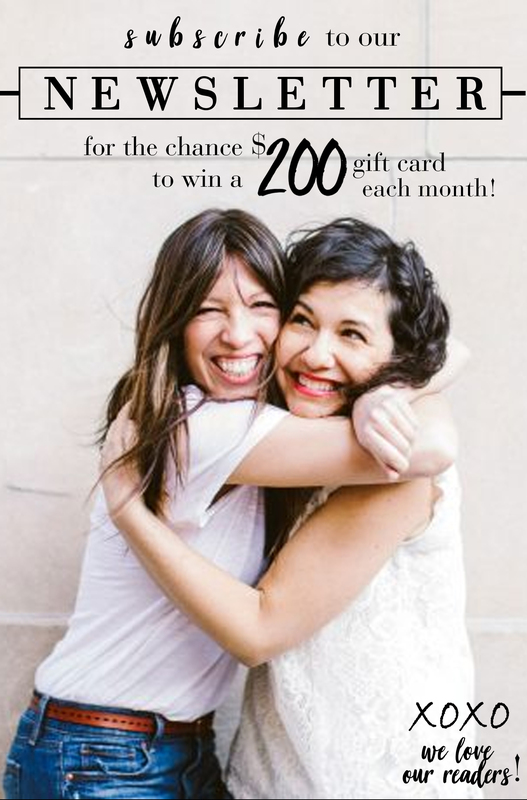 So instead of stressing about pilling, just…. First of all, I’ve had zero luck with sweater stones. I can’t even begin to understand all of the good reviews. I’ve used an old (now discontinued) sweater shaver from Brookstone for years. But there’s nothing particularly special about the one I have — there are a ton of identical shavers on the market. This one in particular has amazing reviews and will be my next purchase when mine finally burns out. I mean seriously. Enough said. Be sure to clean out the sweater shaver “basket” after each use — cashmere tends to fill it rather quickly (and mine won’t run if the basket is full). Also, I like de-pilling cashmere on something with a little give, like an ironing board (or my bed). Just go slow and press evenly, with a slightly firm pressure. (But these sweater shavers are pretty foolproof, so don’t stress). What are your favorite cashmere sweaters? Did I miss any good brands? For Pinterest (if you care about that sort of thing)…. Thank you for this timely post! I was just wondering if I could machine wash cashmere, and now I know. Yay, coziness! This is great! Where is the striped sweater you’re wearing from? Great idea to use a lingerie bag! I’m going to try it. I really like Halogen cashmere from Nordstrom. I always buy a couple at the Nsale and they are under $100 and have always lasted well although I have not put them in the washing machine but I will try it now! I bought an Equipment cashmere sweater on crazy sale a few years ago and it’s been amazing. One of my very most-worn items–and I live in Texas, where our winters are much shorter and less intense than yours! I can only imagine how much it would get used in a colder climate! This year I bought my twelve-year old daughter one, her first, for Christmas. Partially because now she’s big enough (as in old enough) to take care of this sweater properly and keep it for the rest of her life, partially because she’s big enough (as in tall enough) that we can now share clothes and I can borrow it. Shopping for her is hit or miss these days but she’s worn it a lot since Christmas, and that makes me feel as warm and fuzzy as the sweater itself does. OKAY THAT GOT SAPPY, puberty mom life is weird, but anyway, the sweater is still great. Go team cashmere. I adore my Theory cashmere Karenia sweater based on your past recommendation. It’s the one I reach for even when I’m sick with a cold and everything else feels uncomfortable on my skin. Agree, thicker cashmere=less pilling. Are your favorite Equipment and La Ligne sweaters the same thickness as the Theory? I want another thick cashmere in black but I love my Theory so much, I don’t know if I want to stray! Any thoughts on & Other Stories / H & M or Uniqlo cashmere? Love this post! I needed a new sweater pill remover so will go with your recommendation. Thank you! I am also glad to hear I am not the only person who sleeps in cashmere sweaters. I have an old ratty cashmere cardigan from college that I wouldn’t wear around but is perfect for winter pjs. 🙂 What I’m always looking for are sweaters without a band around the waist (just a straight waist) and that are more of a traditional cut rather than oversized. I have narrow shoulders but wider hips, so I can’t pull off giant on top and bottom! I’d love to find a good one with a deep v. Thanks for all of your recommendations! Quick question… Shana, do you wash the J Crew cropped turtleneck sweater (I think you have red and green, Scotti has bright pink, etc.) this way? I have two of them and they pill terribly. I know they’re not cashmere, but I love them and wear them all the time. I would love to clean them on my own but I’m afraid to mess them up! I recently scored a couple excellent cashmere sweaters on Saks Off 5th web site. They are Saks 5th Avenue Cashmere- both originally around $300 & purchased for under $80. Beautiful cashmere. Not super thick, but good quality. I use Eco Nuts & machine wash delicate/cold. These have both come out in perfect, powder-puff soft condition. I have shared the gospel that is Sweater Shavers with all that I know. It’s changing lives. 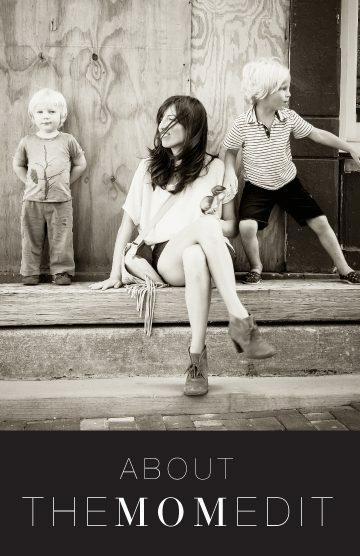 I’m thinking about trying the sustainable brand Naadam https://naadam.co/collections/womens-sweaters-cardigans So many of their styles are more in my zone than the cropped Everlane styles. Has anyone tried them? Better yet, compared?